Concrete countertops are manufactured either top up or top down. With a top up technique, where the finished countertop surface is troweled, whether cast in place or cast in the shop, the formwork-or molds-do not have to be so perfect, since the surface you are casting against will seldom be seen. The exception to this is the edges, which often are made with a molded edge form, available from a variety of sources or make your own rubber edge forms. Molded edges can be rough like broken stone or smooth and rounded. Concrete countertop molds are made by a variety of countertop mold manufacturers each offering a unique benefit. Top down casting, on the other hand, means that the countertop surface will be the face that was cast against the mold. For that concrete to look as good as possible, the quality of the mold is essential-it must be perfectly smooth and perfectly sealed. As Fu-Tung Cheng writes in his definitive book Concrete Countertops, "Molds are beautiful in themselves. They are the hidden, backstage actors; they are the chrysalis from which a countertop, transformed from slurry to solid, emerges." Melamine, a plastic coated fiberboard, is the standard material used to mold the countertop surface. Melamine will only last for one or two castings but since most countertops are custom, that's seldom an issue. "If you're a precaster," said countertop pioneer Buddy Rhodes, "you can get several uses out of a sheet of melamine. For one thing, melamine has two sides so you can flip it over and use the other side for a mold. Then in the end you can break it down and use it for packing. We make crates out of it." "There are a lot of different ways to make molds," said Lane Mangum from the Concrete Countertop Institute. "You can use almost any material to make the shape you want. But there are a couple of other properties that a mold needs: it must be waterproof and, depending on your method, smooth and releasable." Strength and rigidity. The mold must be able to withstand the pressure of fresh concrete without bowing or distorting. Surface texture. Concrete will mirror the surface its cast against, so if a smooth surface requiring minimal hand finishing is desired, use a smooth forming material such as Formica. If you plan to hand trowel the countertop surface (by casting the countertop right side up) or mechanically grind the surface after it hardens, then the texture of the mold wont be as important. Workability. Fabricating a mold especially for complex countertop layouts with curves or odd shapes often requires a lot of cutting and manipulation to get it just right. A material that's not prone to splintering or chipping when cut will be easier to work with and reduce waste. Many materials, including melamine and Plexiglas, will release from the concrete without an added release agent. 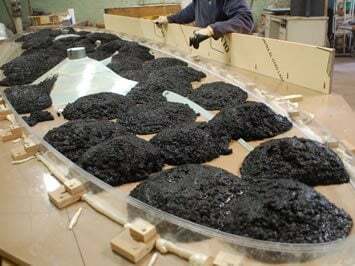 Other materials, including steel and rubber, require a release agent to be applied prior to pouring. Mangum cautions against using too much release agent on a surface if you hope it to have a finished appearance right out of the form, since release agent can leave a scum on the surface. To "pop a perfect slab" she recommends using something very smooth that will release without a release agent-like Plexiglas or melamine. With concrete, water content is an important factor in appearance. So if the mold leaks, or absorbs water, the concrete in that area will have a lower water content and therefore a different color. Molds need to be watertight.